18" and 27" length options available. Lightweight reacher & durable plastic frame. Magnet on handle to receive lightweight metal objects. Allegro Medical presents the Lightweight Reacher Grabber. This light, ergonomic reacher will feel like an extension of your hand as it extends your reach 18 inches. Instead of pulling back on the handle, a simple press of the plastic trigger closes the claw. It’s especially helpful for those who don’t have a lot of hand strength, but is excellent for anyone due to its lightweight design. The claw also rotates 360 degrees, so you can easily switch its direction. Just pull up on the claw and rotate it. The reacher even has a magnet on the back of the handle which you can use to pick up light metal objects. You’ll find it’s a handy little reacher to have around your home! 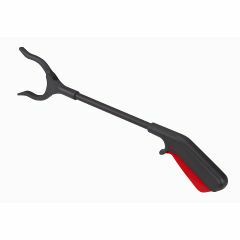 This lightweight plastic reacher extends your reach 18 inches, allowing you to pick up hard-to-reach objects. Ergonomic trigger handle is easy on your hand. Claw rotates 360 degrees to reach any direction. Simply pull up on it and turn. Convenient magnet on the back of the handle picks up light metal objects. Rubber cushion tips help secure your grasp. Average Health. Elderly. Have Rheumatoid Arthritis. Chronic low back pain. The others one I have are not good at all and also more heavy. Jus love this one and I do recommended. Elderly. Following Surgery. Emergency. Daily reaching aide. I have used this reacher daily for 6 years in my store. When my 91 year old Mom could no longer bend over to pick up her newspaper, I ordered the same reacher for her. She also uses it daily and has very little gripping muscles in her hands. Easy for her to use without any issues. in a power chair full time and drop everything. Following Surgery. Used after back surgery. This is so helpful after back surgery. I have several longer reachers but this is great to reach things just out of reach and to help getting dressed. What is on the tips of the grabbers? The tips are plastic, coated with a rubbery surface for a better grip. There is a pretty strong magnet in the handle end that will pick up fairly heavy things like silverware or a letter opener. What is the opening measurement of the widest opening reacher. The one we have now doesn't open wide enough to pick up some items. I have one reacher that opens to 6"